Once you have selected your app in Sailthru Mobile, analytics are available in two areas of the interface. 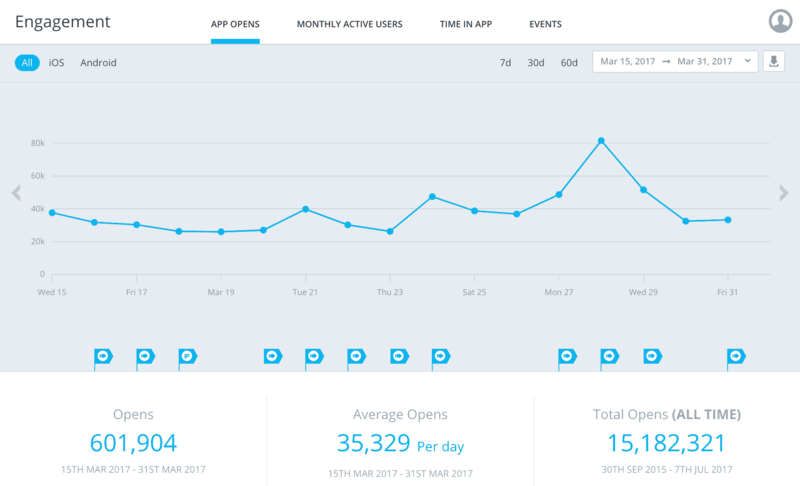 Engagement – App opens, monthly active users, aggregate time that users are spending in your app, and other events that your app sends to Sailthru Mobile. Installs – App installs and uninstalls for any date or date range, including all-time totals. Pushes Sent – Total push notifications sent for any date or date range, including all-time totals. View each notification’s text alongside this data. Geography – Your users across countries, time zones, and languages. Technology – Your users’ device types, OS versions, app versions, and Sailthru Mobile SDK versions. Sailthru Mobile also offers Message Performance Analytics that track events that occur from a push, for example, app opens, or other custom conversion events. Message performance analytics are displayed when you click on an in-app or push message under the messages Messages. For more information, see Message Analytics. You can also export Sailthru Mobile Analytics via an API directly to other systems that you use for reporting analysis. For more information on how your development team can import data into other systems, see Getting Started in Sailthru Mobile’s For Developers documentation. A single graph, with underlying metrics at the bottom of the page. Clickable flags displaying Messages sent, which correspond to the timeline of the graph. 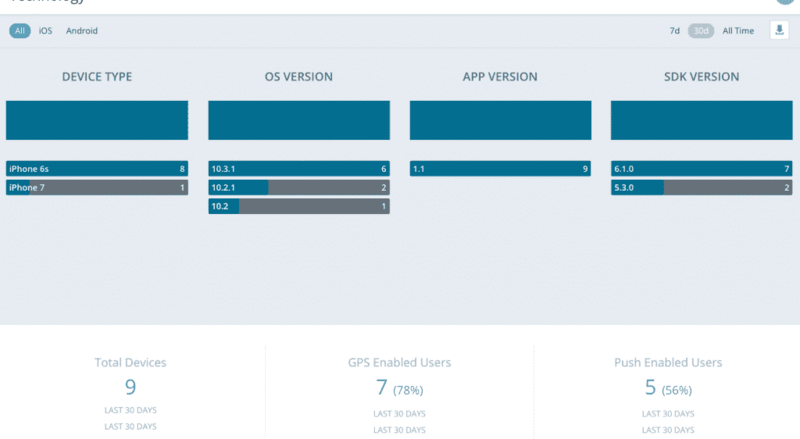 The option to select to view All users in aggregate, iOS and Android users simultaneously in separate overlaid graphs (but with the same aggregated metrics listed below), or only those using either iOS or Android. Note that separating data by OS is not available on the Pushes Sent page. The option to view data for the last 7, 30, or 60 days, or a custom date range. A download button to download hourly or daily data to a CSV file. The flags shown at the bottom of your report graphs indicate the content of each push notification or in app message correlated to the time it was sent, as well as any custom comments you have entered in this interface as internal notes. These help to relate the impact of your mobile messages and other factors (that you add as notes) on engagement. Click to view the content of the push notification that was sent at the indicated time. Click to view, edit, or delete the content of the custom (internal) note. Hover your mouse at the bottom of the graph area and locate the time and date with which you want to associate the note. Click that location, enter your comments, and click Save. When you open an existing note, you can then click the gear icon at the top-right of the note to Edit or Delete the note. For more detail on the analytics displayed on these pages, see App Analytics. The Geography and Technology pages each have their own unique interface, tailored to give you an easy view of these details across your user base. For detailed information on each page within the Sailthru Mobile Analytics interface, see the following sections in App Analytics.